from Timeflees – Filippo Rivetti. Vivid Sydney is one of our favourite festivals! This year, join us on an exclusive Sydney harbour cruise and watch the city come to life with spectacular light displays! See the world famous Sydney Opera House from a different perspective, as it’s sails light up with animated displays. Watch on from the water as light projections dance across it’s sails along to awesome beats. There’s no better way to escape the crowds all trying to catch a glimpse of the ‘Lighting of the Sails’, than by experiencing Vivid Sydney from your private catamaran on Sydney Harbour – the best seat in the house! Avoid the crowds and see the light installations from your prime seats on our Rockfish catamaran. Hire Rockfish for a 2 hour cruise. 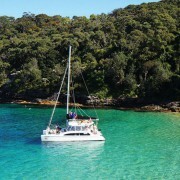 Our catamaran can have up to 30 passengers which works out to be $30 per person. If you are thinking of having over 30 people or under 20 people please get in touch to discuss other options. BYO alcohol & food, so no excess spending on expensive drinks! What happens on your Vivid Sydney Cruise? We’ll pick you up in Darling Harbour where we’ll start our cruise by passing the Australian Maritime Museum as it lights up, catching a glimpse of the Cockle Bay water shows. As we head out of Darling Harbour, we’ll get a great view of the Sydney harbour bridge, lit up from both sides. We’ll cruise underneath the bridge, with plenty of time to get the perfect photo, before heading towards Vivid Sydney’s iconic light displays illuminating the city. We’ll slowly cruise past Circular Quay where you’ll get a great view of the light displays on Circular Quay’s many buildings and the ‘Lighting of the Sails’ on the Opera House. Moving on we’ll sail past the Botanical Gardens where we’ll get a view of the glowing trees and it’s central Vivid Sydney feature, the ‘Garden of Lights’. Once we’ve checked out that side of the Harbour we’ll start our journey back to Darling Harbour where we’ll come across amazing views of Vivid Sydney with the Opera House, Sydney Harbour bridge and other boats lit up, all in our vantage point! Before heading back to Darling Harbour, we’ll cruise past the famous Luna Park then back past the new and improved Barangaroo for one last view of Vivid Sydney’s lights! Select your date and pick up time below. You’ll pay a 50% deposit to secure your spot.